A few weeks ago my friend Jessica posted pictures and an entry about her visit to the Melting Pot. I've never been and I know it is a favorite of quite a few of my friends. I also know it to be very expensive. I looked into the Melting Pot closest to our house (40+ minutes away) and decided it was way too expensive considering I don't even know if I like fondue. I don't remember loving it as a kid. So, I thought we'd do the Melting Pot home style instead! 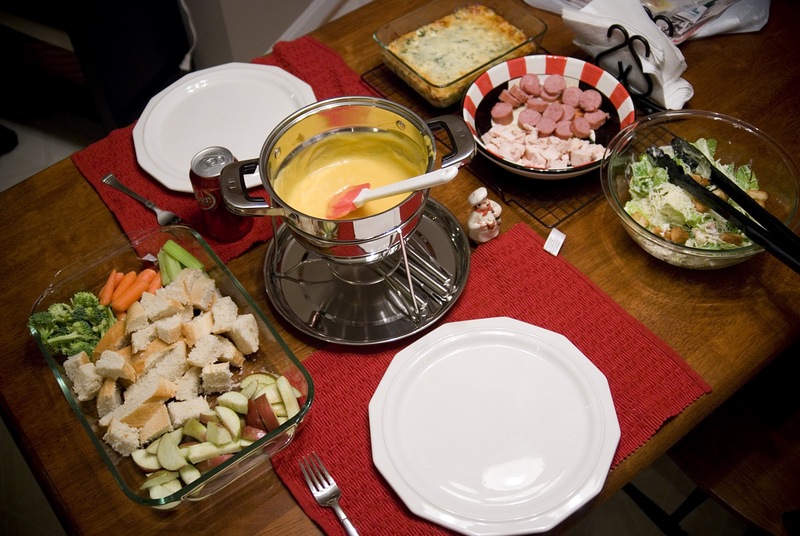 We started with caesar salad and then moved onto the main course - fondue! We had apples, bread, broccoli, carrots and celery (which everyone laughs at me about, but again, I've never "fondued"), chicken and sausage. I also made my sister in laws archichoke and spinach dip, again. Yum! So, after all this work I have come to the conclusion - fondue is not for me. I guess I'm expecting more of a "nacho cheese type dip" and that's just not fondue. It was a fun meal however, and very glad I saved $100! Yeah it is expensive, but if you wait for a coupon it helps. I kind of felt it was more for the experience. There aren't too many restaurants that you are there for 3 + hours. I do agree the cheese is not my favorite, the desserts were wonderful, though!